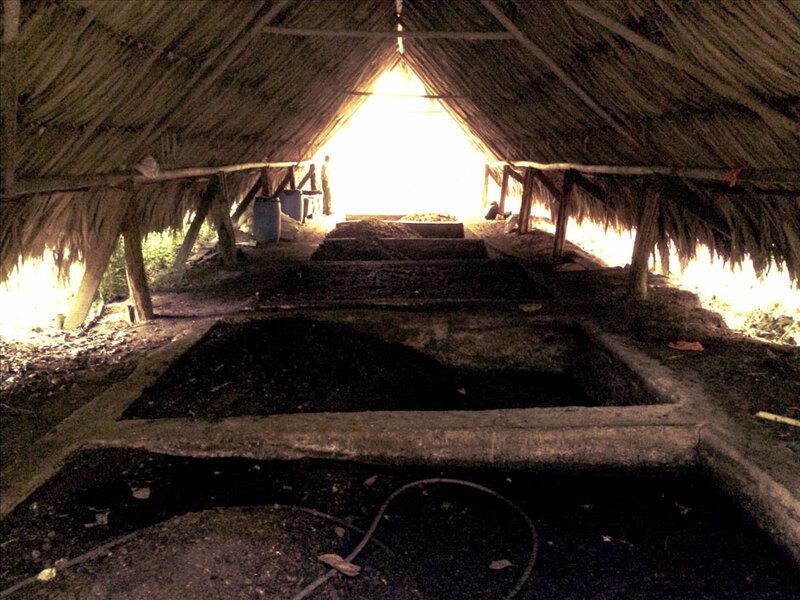 Journalist, beekeeper and author of "Compost City: Practical Composting Know-How for Small Space Living"
We've all been transfixed by Francis Ford Coppola's awesome oeuvre of films, but did you know his genius also extends to eco-friendly jungle hideaways? Blancaneaux Lodge, tucked deep in a corner of Belize's Maya Mountains, is one of three sumptuous properties in Central America owned by the filmmaker, who also has a fabulous fourth in Italy. 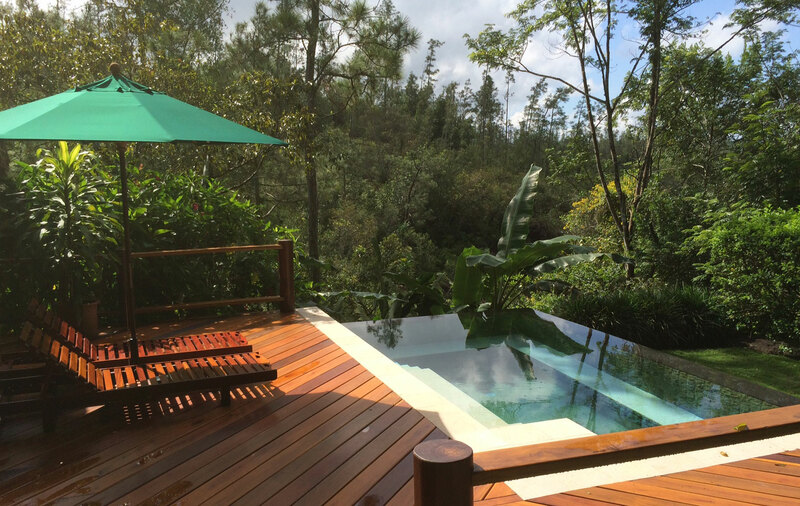 The magic of Blancaneaux is the seamless way it marries mindfulness with luxury travel. Accommodations are artful cabañas and villas constructed with screen walls and open air decks and lounges, inviting guests to truly immerse themselves in nature. Yoga mats tucked into each closet encourage guests to stretch their bodies and spirits while telescopes invite you to contemplate the cosmos close up. Unlike some destinations that use green or holistic accents as the decoration du jour, Blancaneaux actually walks the sustainability walk. In fact, it struts. In 1993, the Coppolas installed a hefty hydro-electric plant that harnesses the muscle of Privassion Creek, which gorgeously gurgles through the property. Any electricity that isn't used in guest rooms or on general operations is diverted to the hot pool at the Waterfall Spa -- which is maintained at a toasty 100 degrees, perfect for a mid-day or late night dip. Blancaneaux is also home to a lush 3 ½ -acre organic garden that supplies all the tasty vegetables and most of the fruit used in the property's two restaurants. Thanks to the blissful weather of the region, the garden team grows a vast range of produce all year that includes lettuces, herbs, beans and tomatoes through careful planning and crop rotation. With such bounty, keeping the soil healthy is key. How does the Blancaneaux team do it? Compost, compost, compost! 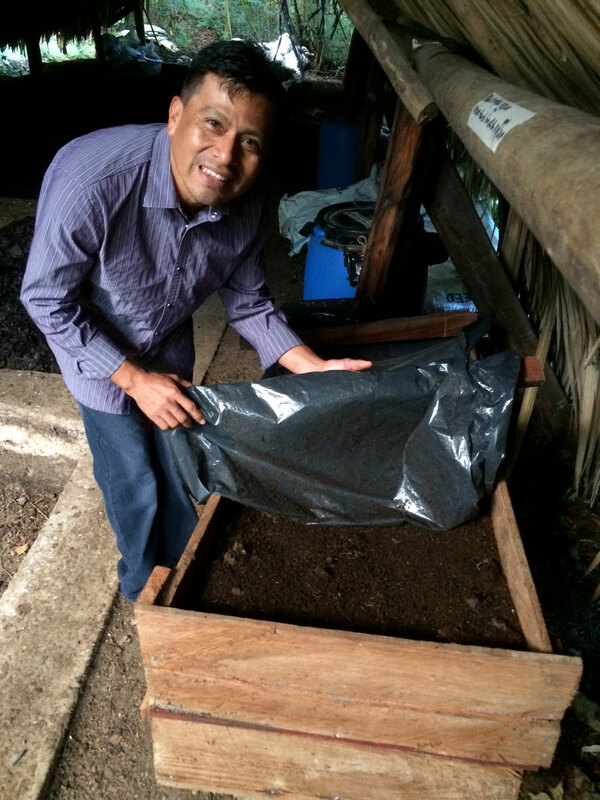 During a private garden tour, I learned about the resort's super soil practices, large-scale compost strategy, and gardening techniques. Here are some highlights from my chat with Blancaneaux's General Manager Bernie Matute -- who in his spare time also runs his family's 100+ acre organic fruit farm! Please tell me a little bit about the history of this gorgeous garden! BM: At the initial stage, we got assistance from [educator, organic farmer, photographer and writer] Michael Ableman, who inspired our staff with his teachings about having a rotating crop to raise the quantities required to operate both restaurants. Staffing the farm happened very gradually. What was the soil like when you started the garden? The soil is acidic and intolerable to the growth of any other plant except natives such as Guava and Custard Apple (Annona reticulata). Top soil has to be trucked in to build up raised beds. We make the beds out of discarded wood slabs from our wood supplier at the progressive Mennonites, who give us a variety of barba jolote, mahogany and bullet tree. Compost is added as a fertilizer and also to soften the soil. How did composting become a part of your farm practice? Because we had horse stables and all the trimmings of the landscape, we thought that composting would be a good use for all of the additional material on the property. It would also reduce our garbage. This was around 1998. What is your compost set up like? We have 6 rotating pits filled with about 900 pounds of horse manure, 250 pounds of kitchen waste, 1200 pounds of chicken manure and 1 gallon of molasses. In a week, we accumulate the kitchen waste by combining two of our kitchens. We have 50 chickens which we raise for eggs and 16 horses in our stables. We add chicken manure for nitrogen, phosphorus and potassium, which is a deficiency in the soil, and additional manure is collected from the farms of the progressive Mennonites who live in the area. How do you manage the piles? Once the ingredients are put together, they are soaked with water and left to stand for one week. After the seventh day, the garden staff will start to turn over the compost. At this stage, rubber gloves and gas masks are used to protect the staff and EM Microorganisms are added to dissipate the odor. The compost is then turned every three days. At the end of 45 days, and when all of the heat of the compost has disappeared, it indicates the material is ready for use. We use the FIFO [first in, first out] system so we harvest the old material first. This was a project that the Ministry of Agriculture started. They have always looked up to us and use our garden as a model for the aspiring organic farmers. We took about ¾ of a pound from them about seven months ago. Their total weight is 7 pounds currently! We had lots of paper from our office and would normally send it to the recycle station to be converted to toilet paper. This was another use we thought would benefit the property directly. Elicer Tzib, our head gardener, uses the end product for the nursery only. We noticed a huge change in the seedlings since we started this project. We had better yield from the seeds and the plants look a lot healthier. What were some of the challenges the farmers/composters experienced as they set up and developed the compost piles? The biggest challenge was gaining knowledge. Most of our garden staff farmed at their family farm but in the conventional way. Alternative farming was difficult for them to embrace. Finding them the proper source overcame all of this. Having a leader like Elicer made a huge difference. What are a couple of the biggest yield crops on the farm, and how much do you need to grow to support the kitchen needs? Tomatoes are one and amount varies by season. In peak season we plant anywhere between 125 plants to 150 and our off season is 75 plants. Lettuce is the second largest. We plant about 1 oz. which yields nearly 300 pounds of lettuce for a month use. In the off season, we plant only half of that. Was there a cost savings for Blancaneaux in not sending the various wastes to the landfill? There is no saving really. We do this to show our contribution to Mother Earth. 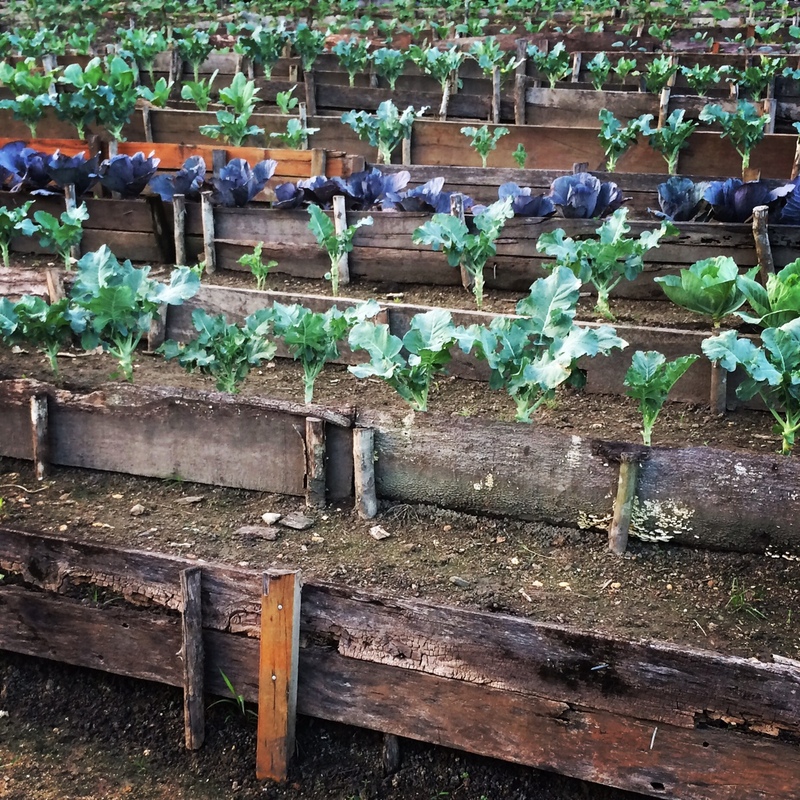 Family farms are very common particularly in the Cayo area, as it has some of the most fertile soil in the country. They range from 10 to 100 plus acres. We hope that by involving our staff, they will take these practices back to their communities, implement better practices at home, and teach others to do the same. This piece was originally published on The Compostess blog. To learn more about composting at home or in your community, check out "Compost City: Practical Composting Know-How for Small-Space Living." All photos by Rebecca Louie.